Finding someone’s email address is one the key pain points in modern recruiting. The way we recruit has changed. The war for talent is ranging on. For these reasons, instead of using “post and pray” method, we now have to proactively search for talent. But what to do when you can’t find your perfect candidate's email address? How to find an email address for free? Why are email finders important for recruiting? Imagine this: You found your perfect candidate persona. Their work is amazing, and by browsing their social networks it also seems like they have a great personality - just the right fit for your company. Check out our Guide for Finding High-Quality Job Candidates! But, there’s just one thing: How do you get in touch with this candidate? You can’t find this candidate’s email address anywhere. And I mean ANYWHERE. Finding someone’s email address is one of the key pain points in modern recruitment marketing. The way we recruit has changed. The war for talent is ranging on. For these reasons, instead of using the “post and pray” method, we now have to proactively search for talent. And when we find perfect candidates, it’s crucial to contact them as soon as possible, in the most professional way - via email. But what to do when you just can’t seem to find your perfect candidate’s email address? Spending hours and hours looking for a single email address can be really frustrating, but it can also mean a world of difference in the process of finding that perfect candidate. So what to do when everything seems hopeless, that email address is nowhere to be found and it seems you’re gonna be left empty-handed? We'll show you how to find an email address for free. Yes, it is possible! You might have tried to contact that perfect candidate by sending him/her a message on LinkedIn, but haven’t heard back. No surprise there - your perfect candidates already have a job, so they’re probably not checking their LinkedIn accounts (at least not regularly). Actually, 73% of your potential candidates are passive, especially the best job candidates. Passive candidates are those candidates who are not actively looking for a new job but would be willing to accept a better offer. Remember, a better offer doesn't necessarily mean more money. It can be a flexible working time, education, opportunities to grow, benefits, cool projects, and many other. That being said, you have to think carefully how to approach passive candidates. Why email finders instead of social media? But first, you have to find a way to reach them. If you can’t seem to find their email address, you might think of another solution. You could try to contact your perfect candidate through social media networks like Facebook or Twitter, but this is not a safe way to go. First of all, it is questionable whether you will be able to reach them. If you are not friends with someone on Facebook, your message will go into “Other” folder, and let’s be real - who ever checks that one? Second, people pay more attention to their email inboxes. Most of the people have profiles on many different social media networks, but use only a few of them regularly. Email, on the other hand, is something we all use. Every single day. Third, email is the most professional way to contact someone. And you do want to look professional when you’re trying to recruit a star candidate and win him/her over! How to find someone's email address? So how do professional recruiting masterminds solve the problem of “missing” email addresses? How to find an email address for free? They use so-called “email finders”, online sourcing tools that can help you find somebody's email address for free in as little as a few seconds! There are many similar email finders out there, so it can be very difficult to find the perfect one, especially if you have a tight budget (or no budget at all). That’s why we did a research of the most popular email finder tools to find the very best among them, tried them out and came up with this top 5 list of the best email finders you can use for free. Email Hunter allows you to search for email addresses by the person’s name, but also by domain. Search by domain means that if you type in any company domain (company.com), it will scan that domain for email addresses and you’ll quickly get a list of all publicly available email addresses associated with it. Pretty cool, huh? And that’s not all! When you find an email address you were looking for, you can type it in and Email Hunter will verify it for you! You’ll have to sign up to use it, but you can do it with your Gmail account in just one click - it’s totally worth it! Try it: Click here to try Email Hunter yourself. Once you create a free account, you get 50 free credits, so you can try it out yourself. Try it: Click here to meet Norbert! Find That Lead offers a few more search options than previously mentioned email finders. You can search for an email based on a name and domain but also based on a social media profile URL. Currently, they support LinkedIn and Twitter. You can also choose between the different variables (e.g. location, job title, company industry, degree etc.) to make your search more accurate and find the right prospect. Find That Lead also offers email address verifier. You’ll have to sign up to use it, but you can do it with your Gmail, LinkedIn or even Facebook account in just one click. Try it: Click here to find out more! Lusha is a browser extension focused on finding personal email addresses and phone numbers from people’s social profiles on sites such as Twitter or LinkedIn. It also offers an email template you can edit, save and use to reach out to potential candidates. Sign up for free, add the extension to your browser and then go on and check a social profile page on sites such as Twitter or LinkedIn. Lusha will find contact details for the person whose profile you are looking at! Try it: Click here to see Lusha in action! Headreach is very interesting email finder because it offers a possibility to search and find someone’s email address and social profiles by their personal name only, but also by domain, company etc. It also offers an advanced search with different variables (e.g. position, industry, keywords, country, location, etc.). Once you sign up for free, you get 10 free credits, so you can try it out. Try it: Click here to reach Headreach! 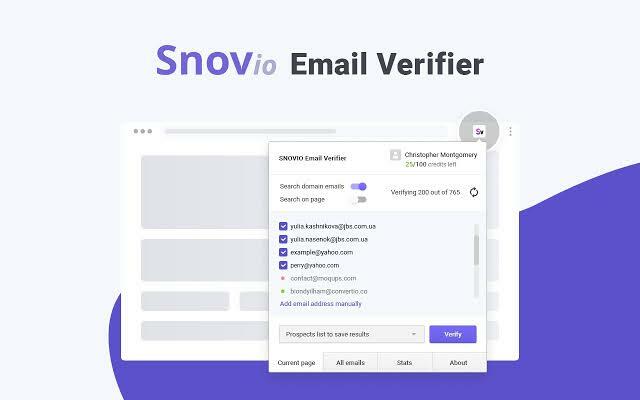 Snov.io offers a multi-functional email verification tool to verify both bulk email lists and single emails. You can verify emails without even leaving a browser (verifying a lead found on any website by Snov.io extension) or by uploading them into the tool and verifying them in bulk. Real-time verification methods involve checking for typos in email addresses, pinging a domain name, comparison with the database of bounced emails and comparison with 3rd-party services. To spice things up, Snov.io offers an API for a comprehensive email validation experience. Sign up with an email address or with your Google account. Then, add an extension to your browser and you are good to go! You can also use the API, if you want to integrate it into your app. Try it: Click here to try it right now! Webdef.com enables you to instantly find all email addresses for any business online. Simply enter a company website and Webdef returns all emails along with the publicly listed sources. One more quick click and you can verify each email in real-time against their live email server. Never send another bounced email! Now you’re ready for exporting and importing into your favorite CRM. And unlike Webdef’s competitors, for just one flat fee everything’s included. Easy, right? 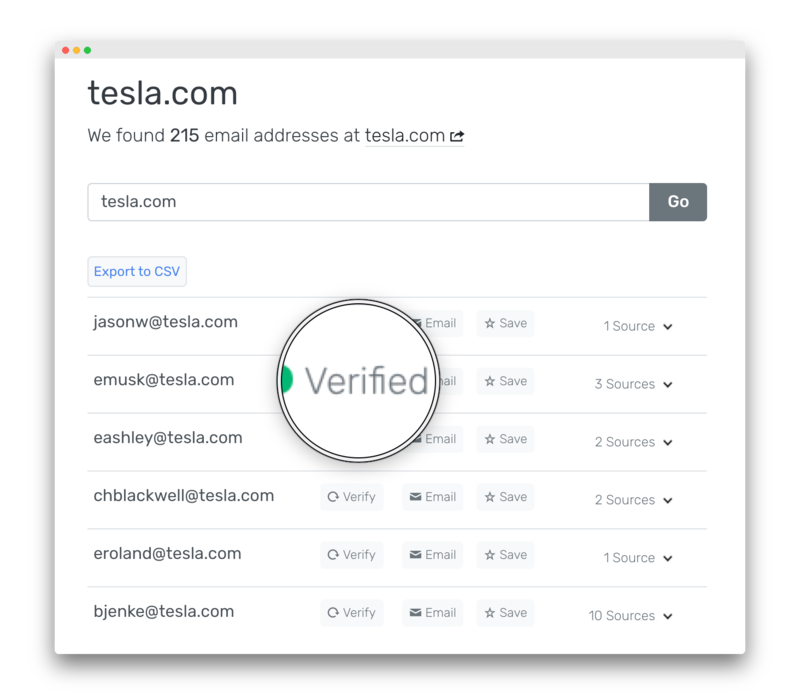 Enter any domain into the search field, for example: tesla.com, and you’ll get hundreds of emails returned. Sign up for a free account to unlock the full email address, upgrade to a paid account for thousands of searches. It doesn’t get any easier! Try it: Click here to give it a free test drive right now. ContactOut is a simple browser extension that helps you find email addresses and phone numbers of anyone on LinkedIn and already have thousands of users from a third of the Fortune 500 (like Microsoft, PwC, and Symantec). ContactOut finds emails from 75% of Linkedin users at a 97% accuracy rate. It’s earned us multiple mentions on the ahrefs blog as one of the best freemium email outreach tools available. Add the extension to your browser and register, then go and find anyone in LinkedIn after that click the extension and the email addresses and phone numbers will appear, if you want to find the specific email just add the domain. If you tried out all of the above mentioned free email finders and came up empty-handed, don’t despair - all is not lost yet! We present you Email Generator! This completely free online tool will help you generate possible email combinations and see if any is real. Try it: Find that email address with Email Generator! If your potential candidate is active on Twitter, you have to try this! This tool wasn’t originally meant to be used for finding email addresses, so its powers are still quite hidden. Take advantage of that and learn how to hack out anyone’s email address through Twitter! Try it: Click here and get started with your search! Email finders are just one of the tools that facilitate recruiting. If you want to assure the best recruiting experience for your candidates (and make your life a lot easier), think about integrating your new email finder with your ATS and Recruitment Marketing tools. What about email verification tools? Sometimes, emails addresses that we find are incorrect or not in use. Sometimes, we just don't copy-paste them correctly or we simply misspell them. There are tools that verify email addresses in seconds, and they are useful especially in situations when we send bulk emails to a larger number of candidates. Don't miss out on your best job candidates by not using their correct email addresses, and check out this list of 10 bulk email verification tools. If you want to do a more detailed research, you should definetly check out this great article Top 25+ Bulk Email Verification and Validation Services Compared. Email list verification is important for another reason too: if you send to a large number of inactive or bouncing email addresses, you may become suspicious for email service providers and they may lower your sender score. This can hurt your email deliverability and your messages will end up in the spam folder more often. Take your sourcing strategy to a whole new level! If you want to take your sourcing strategy to a whole new level, we’ve got you covered! With TalentLyft Source, a single web search scans millions of online profiles to retrieve passive and active candidates’ details including email addresses, resumes and more. The profiles that you choose are automatically added to your candidate database.